One statistic commonly used in jest today is that more than half of marriages end in divorce. While this high rate of failure is widely accepted by modern society, it does little to alleviate the pain, stress, and grief surrounding a family going through the divorce process. As Greeley’s family lawyers, Peek Goldstone, LLC is here to support you through every stage of this period in your life. We are here and willing to help couples who are considering divorce, including reconciliation services, divorce representation, and everything in between. Our divorce lawyers are trained to deliver quality services to ensure a positive outcome for your family. 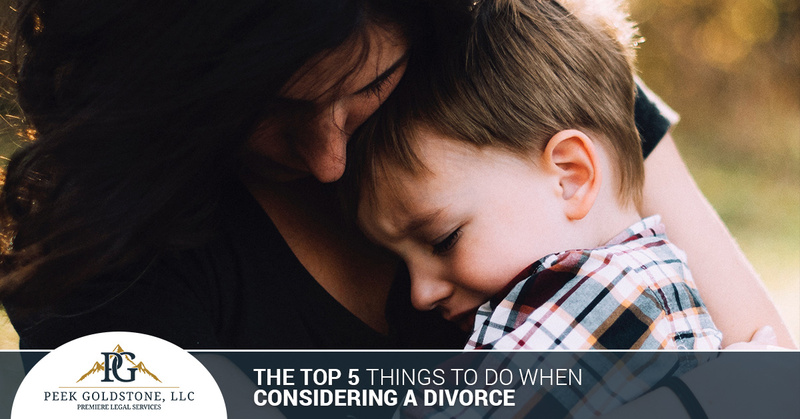 Today, we’ll highlight five things to do when you are considering a divorce. If you need assistance through this tough process, be sure to reach out to our law firm for assistance. While nobody likes to think about the fiscal side of divorce, doing so with your partner can prove to be very helpful in determining which approach is worth the effort. Spouses who split up often face difficulties in paying their own way without financial assistance. You may not be looking for child support or alimony, yet it is essential to determine your financial standing for caring for your children, paying your bills, and so forth. Money should never be a measurement for happiness, but it is important to plan for financial changes through a divorce with your attorney. Filing for a divorce can be hard on you and your spouse, your parents, and everyone involved in your life. If you have children, though, they will often feel the greatest emotional burden of this difficult process. It’s important to discuss the ramifications that divorce will have on your kids. Be sure to talk through this thoroughly, as your decision will set the course of the future. Staying together just for the children is not a recommended plan, but splitting up before trying every resource can lead to regret and resentment. In many cases, communication can be blamed for a lot of the emotional turmoil in a relationship. One approach our lawyers have seen success with is openly discussing your future goals and how you imagine your life will be on the course that you are currently heading. It’s important for this process to remain supportive and judgement free, giving each spouse their time to talk about where they want to be in one year, five years, and so on. Some couples will come to the conclusion that they will be happier if they work toward resolution and building a supportive marriage. Other couples may realize that they are not right for each other and do not want to be together for the long term. In either result, it can be helpful to talk about your current situation and what outcome you two truly want from this emotional time. If nothing else works, many couples turn to a marriage therapist for assistance. This step can be very helpful in making progress before divorce becomes a mutual choice. One problem for many couples is that they will only seek out a therapist when all else has failed, relying on a professional to do all of the work. Instead, it can be helpful to think of a therapist as a guide that can help to equip you with the tools needed to communicate openly and effectively. You and your spouse will learn how to speak clearly and assertively without being negative or punitive. While many people are quick to dismiss a therapist, a marriage counselor can prove to be an effective aid in resolving the divorce process. If you are about to go to court, it’s important to have a divorce attorney on staff to guide you through the complexities of our legal system. Peek Goldstone, LLC is proud to be Greeley’s family lawyers for all manners of family law, from adoption to divorce. Our law firm will work with you to find a peaceful resolution outside of the courtroom to avoid the emotional and financial costs of divorce proceedings. However, if you do decide that divorce is the best option, our lawyers will work hard to represent you for the most advantageous outcome to get your life on track. Contact us today to learn more about our legal services.